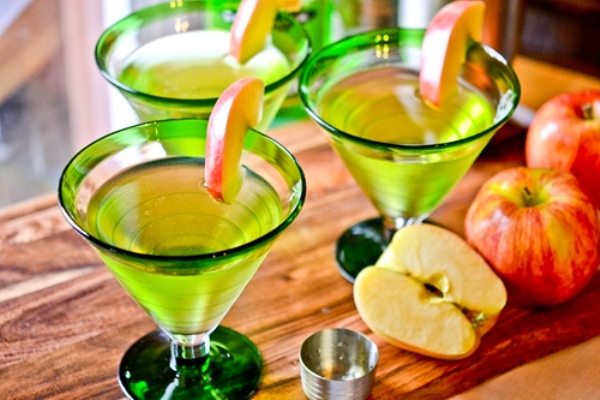 “To make these less sweet, omit the extra half ounce of sour apple pucker and apple juice. That’s usually how I’ve had them at most restaurants and bars, but I do like to sweeten them up a tad more. I love to make mine ahead of time and put it in the freezer till it gets a little slushy, about an hour. It tastes especially good when it’s that cold.” KMONT. Fill a serving glass with ice and water (to chill the glass). Measure out and pour in the vodka, sour apple pucker and juice and place in the shaker. Discard the ice water from serving glass and pour in the Appletinis. Garnish with an apple wedge if desired (I rarely do, it delays the drink) and enjoy!